Has your small business, or SMB considered implementing a unified communications strategy and solution? In this article, we explore the importance of Unified Communications (UC) for small business and SMB’s, and how to get started. We’ve all been through some version of this scenario: You need a key piece of information you received from a client or co-worker in order to move to the next step of a project. You might even know some keywords from the message, when it was sent, and who sent it. Yet no matter where you look; in your inbox, texts, and group chat—you just can’t seem to find it. Turns out it was in a voicemail. In a modern SMB environment, we use many different forms of communication to collaborate effectively. Conversations seamlessly weave among channels depending on your communication needs at any specific time. The problem is often that key information is spread out across a number of possible locations, so tracking something down or keeping everything organized can be more time consuming than it should be. In response to new demands on how we organize our communications streams, your small business needs to develop a Unified Communications strategy. UC can help you get a handle on all of the different channels you rely on to get work done. 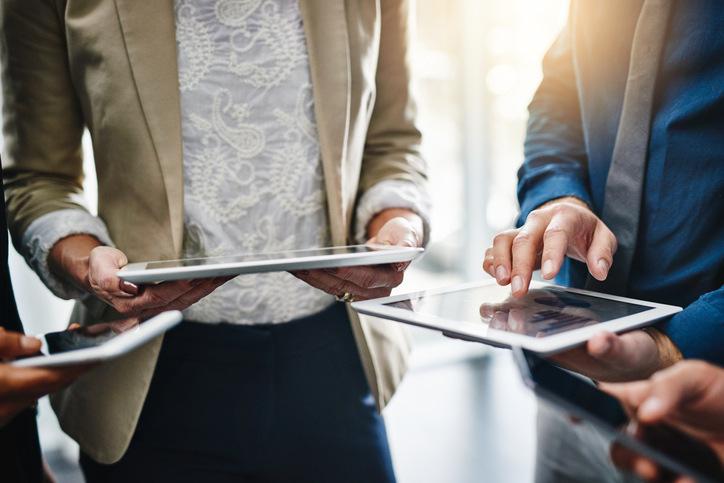 By putting everything in one place, no matter where it originates, and allowing you to manage your communications no matter where you are, a Unified Communications strategy is essential for your SMB no matter what you do. 1) What Are Unified Communications? Unified Communications are a way of pipelining all of the channels we use to get work done into one centralized workflow. No matter how a message comes in—whether it’s text, voicemail, email, or a company chat tool—it all ends up in your UC platform. This simple idea has powerful implications. You don’t run the risk of suddenly being unable to find a key piece of information when you need it the most. You can still use multiple channels for different tasks, but you can be sure that all of your communications are in one easily searchable place. UC also extends to how your communications are routed in the first place. Generally, in low-fi communications setups, incoming phone calls and SMS will go either through your business’ landline or your cell phone. Emails, messaging apps, and any web chat apps you’re using will go through your internet connection. Finally, any internal chat or message boards that you have will run over your intranet. Splitting up your communications like this means you’re reliant on a number of overlapping systems to access your communications. If, for example, there’s an outage at your office, you might not be able to get at anything that’s hosted primarily on your network. If there’s something wrong with the phone lines, you won’t be able to field calls to your company’s support line until service gets restored. Unified Communications routes everything through the cloud, giving you the resilience and flexibility you need to keep on getting the job done no matter what. With everything routed through the cloud, you can make sure that you can access key lines of communication no matter where you are and no matter what’s happened. Furthermore, it makes it easier than ever for someone to get in touch with you when you’re on the go. No matter what number they call, all messages can go through to your cell phone, making everything feel easy and frictionless. At the end of the day, the people who are going to make or break your Unified Communications strategy already surround you: your team. Implementing a UC setup can mean big productivity gains for your small business, but before you do that, think about your core employees. What roles are absolutely fundamental to keeping your business operating quickly and efficiently? What tools do they rely on, and what is the workflow around those tools? These can be more than hypotheticals. Figure out who those people are on your team, and do some sort of shadowing with them. The goal here is to observe what tools they use the most and how they use them, not give feedback on job performance. Be transparent about what you’re looking for, and find ways to make it feel informal. Use this information to generate your specifications for a UC setup that will work for your SMB, and then solicit feedback from the key players you need to stay productive. One common problem that can arise when you’re implementing a Unified Communications platform is not planning for adjustment periods. With any new technology that streamlines old processes, you need to build in training time for your employees and know that it’s going to take some time for them to get fully up to speed. It’s easy to think that you won’t need to spend much time on this because the platform ultimately makes things faster. The key to any good technology rollout is to understand that any up-front investment of time or energy will pay off down the road through better processes, fewer unforced errors, and happier employees. Unified Communications are the go-to communications for many businesses, large and small. For small business and SMBs, however, you need to develop a tailored strategy to ensure it meets the specific needs of your business. Talk to and learn from the essential members of your team to identify the most important specifications. Once you establish your new UC system, invest time and energy in helping your employees use it to its full potential. Route your messages and communications through the cloud to boost your resilience and consolidate your information. Shadow your key team members to learn more about what communications tools they rely on. Build specifications for a UC system from what you’ve learned. Be sure to allow time for proper training.